On the face of it the following seems straightforward enough and IF it is real then it should be a cause for real concern. However, we would advise caution. The events recounted below haven’t been reported independently by any other media outlet in the West or, more crucially, in Russia. Equally as significant is the fact that the report originates from Baxter Dmitry, who has been the source of highly questionable reports in the past. Last month, for example, he reported that the Dutch financier, Roland Bernard, who had exposed Illuminati activities had been found dead. That story appeared weeks ago but it has yet to be confirmed. Had Roland Bernard actually been found dead we’re sure it would have been confirmed by now. It hasn’t. Leading us to suspect that Dmitry may be more interested muddying the waters with sensational claims than exposing the truth. We leave readers to decide but suggest anything from Baxter Dmitry be approached with healthy scepticsm. What we may have here is a fake alternative media that is indistinguishable from the genuine article. The similarity is deliberate because by promoting fake news reports, by association, it calls into question other reports from the authentic alternative media. Ed. 130 mostly American Antifa activists have been arrested in Moscow, Russia after violent rioting, provoked by “violent foreign black-clad thugs” broke out in a popular commercial district in the city centre. Police responded with tear gas and rubber bullets. After being told to disperse, the Antifa activists refused to do so and made preparations for war with law enforcement. Russian state media reported Antifa were then met with tear gas and “non-lethal ammunition,” also known as rubber bullets. Antifa rioters clearly bore the trademark black and red flags, face masks, black attire, and downward spear emblems popular with the violent Antifa movement. Mondays’ riot in Moscow was the first time Antifa have exported their protest against Trump’s presidency outside the United States. Now the activists, many of whom hail from the movement’s Californian chapter, are being held in some Russia’s harshest jails, awaiting a military trial (as their acts are considered “terroristic” under Russian law), and facing up to 56 years in prison. “These people say we have no right to keep them here, even though they came to our land and committed an act of terror. They are saying George Soros will make us release them. 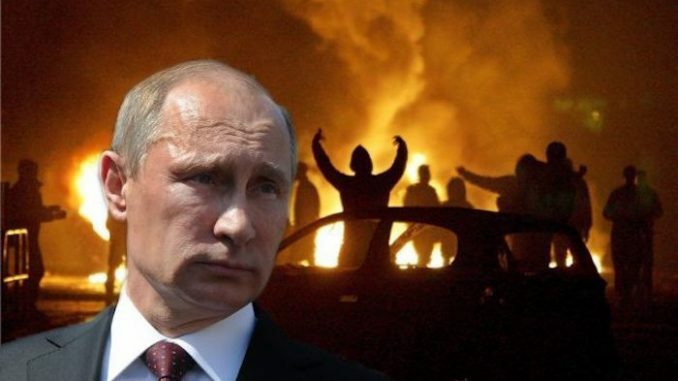 Maybe we will release them in Syria where they can join up with their spiritual allies,” Putin said, hinting at the commonly held Russian belief that Antifa is no better than Islamic terrorists, and working for the same cause.